The Rockefeller tree has arrived in midtown. Gus Rosendale reports. It's beginning to look a lot like the holidays in midtown Manhattan. 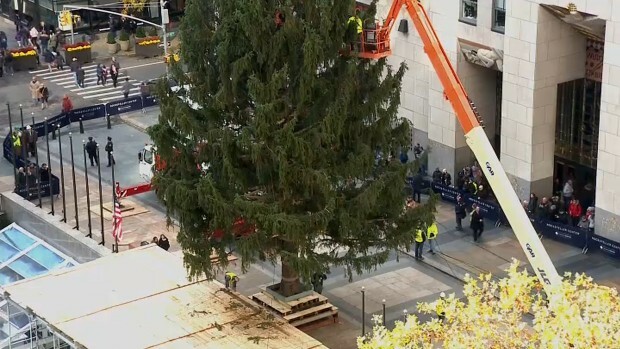 One of the iconic symbols of the season, the Rockefeller Center Christmas tree, arrived early Saturday. 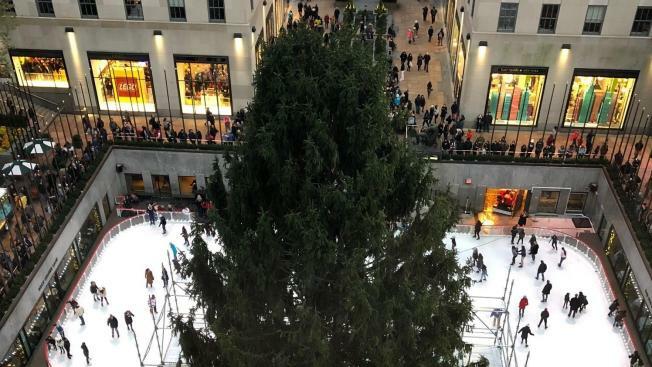 The 72-foot-tall, 12-ton Norway Spruce was brought on to the plaza on a flatbed truck after making the two-day, 75-mile journey from its home in upstate New York. A crane raised the iconic holiday symbol off a 115-foot-long trailer and put it into place around 10 a.m.
About 50,000 LED lights and a new Swarovski crystal star designed by Daniel Libeskind will adorn the tree, which will be lit on Nov. 28. It will remain on display until Jan. 7. The tree comes from the Wallkill home of Shirley Figueroa and Lissette Gutierrez, who gave the spruce a last hug before it was chopped down. "After we bought the house, the previous owner told us, 'Hey, by the way, the tree in the yard? Rockefeller Center has been scouting it," Figueroa told News 4. "When she told me that, I was like, 'Oh, that would be cool,' but I [didn't] believe it. Until they came knocking on the door." Last year's tree, also a Norway Spruce, came from State College, Pennsylvania. The first Rockefeller Center Christmas tree was put up in 1931 by workers building the complex during the Great Depression. The first official tree lighting there was in 1933. Figueroa and Gutierrez said they plan to replace the tree with new ones. "I believe if you take something down, you gotta put something back, so we're definitely going to plant... a few more trees, because she took up a lot of space," Figueroa said. While the two homeowners said it was difficult to part with the tree, both were excited to see it in all its glory at Rockefeller Center. "It's been a little tougher for me," Gutierrez said. "But it's for a great cause — and everybody's going to see it," she said, noting that the tree will be donated to Habitat for Humanity and used for home-building lumber after the Christmas season. "I grew up going to Rockefeller Center every year, and I've only missed a few years that I couldn't get down because of work," Figueroa added. "It's going to be really amazing to be down there and know that the tree came from our yard."